Well, this was a pure right-in-your-face hard-hitting action-movie like a good action movie should be. If I want to watch an action movie then I expect … yes how could you guess it … a lot of ACTION! Not a complicated twisted story with plot twists in such a way that you hopelessly lose the thread, but perfectly depicted combats and gunfights with realistic victims (stacked in packages of 10). I can’t judge whether it’s actually realistic or not because I’ve never been in the middle of such a situation. 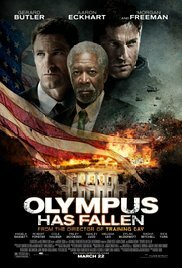 “Olympus has fallen” is simply a put-your-mind-to-zero and don’t-pay-close-attention-or-you’ll-see-the-mistakes movie! Nakatomi Plaza has been replaced by the White House, the Germans have been replaced by cruel North Koreans and McClane is Mike Banning (Gerard Butler) who doesn’t say Yippie-kay-yee … in other words, after 25 years, I saw a restyled version of “Die Hard“. I wasn’t bored for 2 hours. Indeed it’s all reasonably predictable and exaggerated, but it’s entertainment of the highest level. I made a bet with my wife that the time mechanism would stop at 1 second … it was 3 seconds … bummer. Obviously this would be a film with the American superior feeling dripping from it. In the end you can expect a great triumph and the country is again blessed by the almighty shepherd in the clouds (God of course). I was expecting this in advance and at the same time I ignored it because this is the case in 80% of American films. And that it would be a small-cop-screwing-up-and-being-a-hero-who-saves-the-nation-in-the-end film, I’d already noticed! All in all, a nice movie and maybe I’ll watch once more someday just for fun of it. And that’s something that doesn’t happen often. PS. Worst fact in the film: the most wanted terrorist is the man in charge of this North Korean group, but the entire American state security knows absolutely nothing about him and waits for the results of the automatic facial recognition. One hour later they’ll get the info anyway thanks to Bannings who can force it out of one of the accomplices. Incredible !